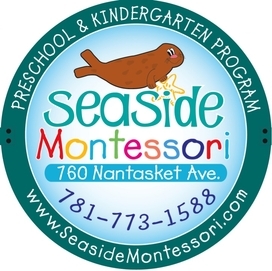 Seaside Montessori is easy to find at the corner of Nantasket Ave and M Street in Hull, MA on the South Shore. Located only a few miles from neighboring towns of Hingham & Cohasset, Hull can be reached by either Rte 3A or Rte 228. Coming into town Seaside Montessori will be on your right just opposite the L Street playground. Come and visit us anytime! Seaside Montessori is a licensed large group early child care program with the Massachusetts Department of Early Education and Care (EEC).